This has been the week in which Manhattan School of Music hosts The Art Song Preservation Society, a week of master classes and recitals, culminating in The Mary Trueman Vocal Competition Finals taking place today at 1:00. Regular readers will recall our affection for Spanish music. We are always glad when a recitalist includes a Spanish language set on his or her program, but it is always the same few offerings. Imagine an entire recital given over to the songs of Latin America! Heretofore, only Steven Blier and his New York Festival of Song has "dared" to make much of Latin American art songs. Last night, as part of this exciting week of art song, we enjoyed a program comprising art songs from all over Latin America. In case you are wondering what the attraction is for us, it is partly the beauty of the language with its pure vowels, and partly because the composers in Latin America managed to escape from the dictates of 20th c. academia that have crippled North American music with atonality and absence of melody. We strongly believe that it is melody that involves our hearts. It tickles our ears, enters our brains, makes us want to hum or sing or whistle. That is why Carmen and Barber of Seville are such popular operas. People take something home with them. From modern music, all we take home is irritability! Now we will step down from our soapbox and tell you how wonderful it was to hear songs from Argentina, Bolivia, and Cuba (the ABC's of Latin America), not to leave out Mexico and Brazil and Puerto Rico. 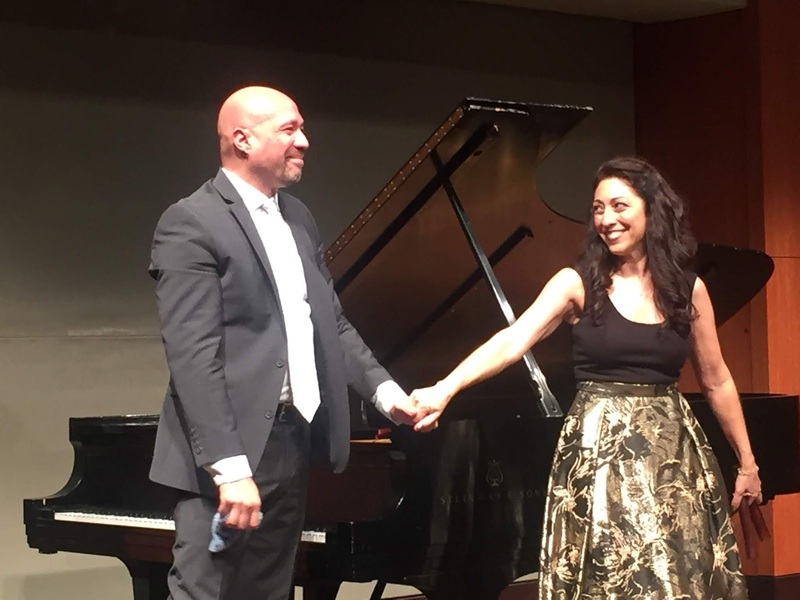 Mezzo-soprano Maya Hoover and her collaborative pianist José Meléndez have been performing together for twenty years and have that trust and comfort with one another so necessary for a successful performance. Ms. Hoover has written the book on this art form! It is called Guide to the Latin American Art Song Repertoire: An Annotated Catalog of Twentieth-Century Art Songs for Voice and Piano. So of course the songs on the program were well curated. The songs we heard melded influences of European, African, and Indigenous peoples. We believe to truly appreciate this music, one should know about the history of each country. We are just beginners and not yet able to discriminate one nation's style from another. But that didn't prevent us from enjoying the melodic music. We particularly enjoyed the piano parts, since Mr. Meléndez gave voice to so many colorful elements. In Argentina's Carlos Guastavino's "Cita", we could hear the chirping of crickets! (Europe mas have their nightingales, but Latin America has crickets, LOL). In Cuba's Gisela Hernández' "Mi corazón lo trajo el mar", we heard the strumming of a guitar. At other times, we heard interesting arpeggi, simple chordal accompaniment, or repeated folk motifs. The vocal lines were invariably lovely and Ms. Hoover is a gifted storyteller. Some texts were puzzling or surreal, but for the most part they were direct and accessible. Guastavino's "Balada" was a familiar tale of lost love. From Bolivia, we heard "Brisas del lago" by Emilio Guttiérez Illanes, which had the character of a folk dance. The tenderness of Eduardo Caba's "Kapuri" was followed by "Kori Killa", his frisky paean to a sweetheart. Here, Quechua terms were included and reminded us of a trip to Cuetzalan in Mexico where the priest adopted Nahuatl attire and had a Nahuatl woman leading the Mass in that language. Narciso Figueroa of Puerto Rico gave us the romantic "Madrugada" and the mournful "Muerta" and our favorite song of the evening--"Vida criolla", a simple song about a simple life, told with strong rhythmic accents. The Brazilian composer Alberto Nepomuceno studied voice to achieve a better understanding of how to write for it. We just wrote two days ago how we wished more composers would do just that! His "Corração triste" showed evidence of this study and was one of our favorites. Hernández' "Romancillo", a setting of text by Federico Garcia Lorca was another favorite of ours. The text was simple and to the point and the piano writing was spare and effective. Mexican composers included in the program were Agustín Lara and the famous María Grever. Lara's song "Arráncame la vida" taught us a new word! We believe that "arrabal" is equivalent to our "bridge and tunnel people". We loved Grever's "Te quiero dijiste", of which the lyricism belies the sadness underneath. The program ended with "La comparsa" by the famous Cuban composer Ernesto Lecuona in which Ms. Hoover accompanied her singing with claves. The rhythmic complexity of the piano was only enhanced!